Ernesto Djedje was one of the leading musicians in Côte d'Ivoire during the 1970s. He released at four LPs - "Le Roi du Ziglibithy" - pictured above, recorded in 1977; "Le roi ziglibithien", 1978; "Golozo", 1979; "Aguisse", 1980; "Zouzoupale", 1981; and Tizere in 1982. 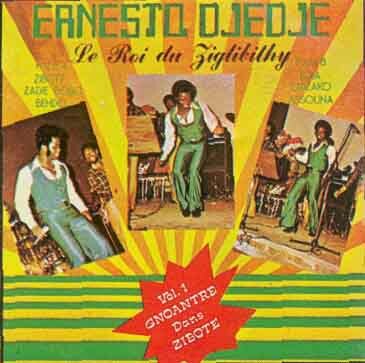 "Ziglibithy" was the name for both a popular dance style and a rhythm, and Ernesto Djedje was its undisputed "king". He was an excellent vocalist, guitarist, and arranger. The brass sections in particular are well-crafted and the overall musicianship first rate. This cassette still sells like hot cakes in West Africa after 40 years. It's available everywhere - I've seen it in Mali, Guinea, The Gambia and Ghana. The Popular African Music recording label released it on CD but there was a serious problem with the tempo being out of whack. A good bio of Ernesto is here.